Global Water's Sewage Lift Station Wastewater Level Sensor (WL430) is based on over 30 years of design and field service heritage, and comes with EXCLUSIVE LIFETIME WARRANTY against lightning strikes. The Sewage Lift Station Wastewater Level Sensor's “Steelcage” design offers the highest reliability in level measurement for severe high solids environments such as sewage, lift stations, storm canals, wet wells and slurry tanks. 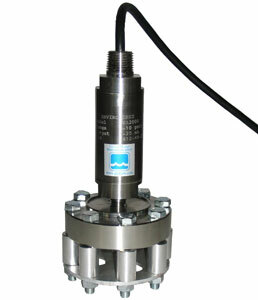 The waste water level transmitter system consists of a submersible pressure sensing element cased in a 316L SST housing. The lift station wastewater level sensor's electronics are capable of withstanding lightning strikes and meet RCTA/DO 160D for lightning direct effects and surge protection for FAA and MIL-STD test and NASA standard electrical surge requirements. All Sewage Lift Station Wastewater Level Sensors are CSA explosion proof and intrinsically safe if used with a client supplied barrier strip. The WL430 Sewage Lift Station Wastewater Level Sensor is supplied with 40 ft. of standard polyurethane shielded and vented cable. The lift station waste water level transmitter's unique cable venting system allows for barometric pressure differential compensation while keeping the elements out, using a Gortex filter encapsulated tip. The ”Steelcage” design gives full protection and allows sensing to sewage levels no matter how much debris/mud/sand or rags build up. Standard Sewage Lift Station Wastewater Level Sensors include 40' of cable, but can be purchased with up to 500' of cable. Please add two weeks for shipping with this option.